These delicious little morsels are no-bake, quick and very tasty. As we're coming into summer (being no bake they're ideal) and party season (quick and delicious) and gift-giving season (they look great in a cello box or in a cellophane bag with a ribbon and a label) I thought I'd share it with you. They can be made ahead and kept in the fridge for up to four days, or freeze them for up to two months (but they've never lasted more than a few days in our house). Combine first 6 ingredients in blender and mix well. Roll into balls and refrigerate 20 minutes. Melt chocolate. 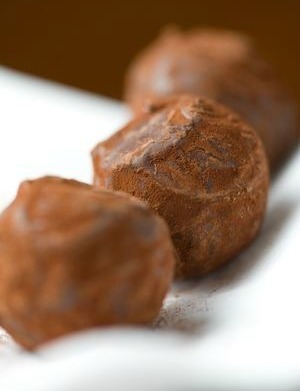 Dip balls in chocolate, drain and place on baking paper to set. Note: I use coconut and biscuits from Aldi, glace cherries from Hindustan Imports, MOO condensed milk, homemade jam and chocolate melts bought when they're on half-price sale. You can use dark or white chocolate for a change. This recipe costs approximately $4 to make. I roll teaspoons of the mixture and get 30 balls from one recipe.